It’s time to give your promotion and tenure process the support it deserves (and probably time to ditch the binders that you’ve used in the past). 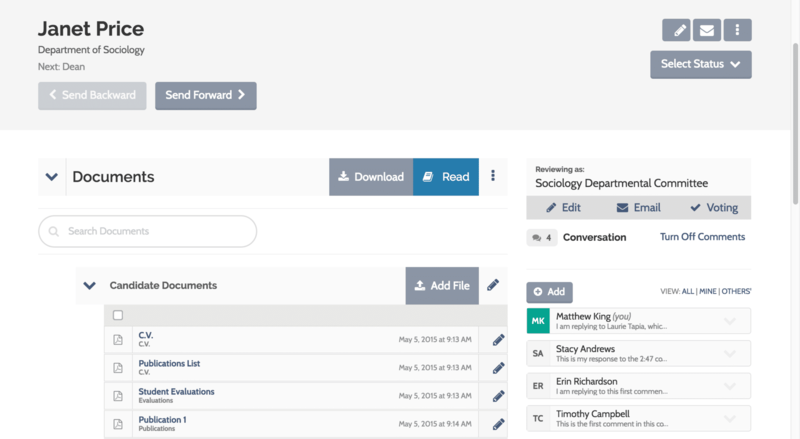 Interfolio lets you address the full scope of academic promotion and tenure—from submission to external evaluations to a final decision—with customizable tools that map directly onto the academic requirements of a tenure review. Faculty review their peers more effectively with tools to review, make notes, send messages, and receive external peer evaluations digitally. Faculty committees receive a versatile, comprehensive tool that matches the actual work they do in the course of an academic year. Staff streamline administrative work with tools to send the entire digital packet between committees, rearrange and add to it, and standardize specific pathways for each type of review. Administrators monitor the school’s commitment to diversity with tools to track promotion and tenure outcomes over time, and support responsible decisions by standardizing the pathways and requirements for specific types of reviews. Candidates receive clear instructions on the tenure process along with simple tools to build a professional-looking digital packet of their materials. In this free webinar and Q&A, find out how Interfolio makes university faculty promotion, tenure, and annual review processes easier and more consistent.